Burn the Rope: Worlds Now Out! 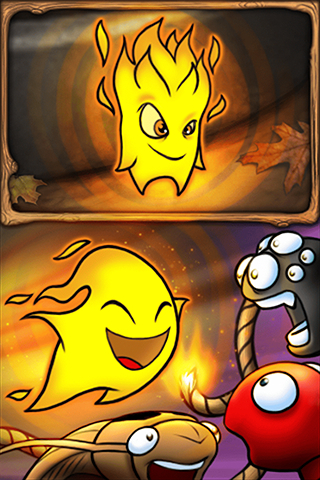 September 13, 2011 – Today Big Blue Bubble Inc. released a sequel to their smash hit iPhone game Burn the Rope, with over 6 million downloads. Burn the Rope: WORLDS ($0.99), the hot new addition to the Burn the Rope franchise is finally available for an iPhone near you! Burn the Rope: Worlds’ Endless Burn is a brand new mini-game where the player tries to collect as many bugs as possible — the catch is that as the player collects bugs their flame trail gets longer, and if they run into the flame trail the round is over! Endless Burn features 3 different levels of difficulty and can be played using different types flames so players of all skill levels can share in the fun. • 100 brand new levels! • Incredibly fun new mini-game Endless Burn! • New Puzzles updated DAILY! • Casual mode for a more relaxed session! For more information on Big Blue Bubble and its ongoing projects, please visit www.bigbluebubble.com or contact them at contact@bigbluebubble.com. We would like to ask you to review “Remotix for iOS” on your site. Remotix is a powerful and versatile ARD / VNC Client for iOS and Android devices. Remotix provides a fast and flawless remote desktop performance, allowing users to connect remotely to Mac OS X, Windows or Linux. Remotix offers full support for Apple adaptive encoding, giving users the best performance on slow connections. With full support of Apple Remote Desktop protocol, it creates a seamless experience for Mac users. We will be glad to provide you as many promo codes as you need for testing. We would like to ask you to review “Football Physics Game for Iphone” on your site. It’s unique app, no analogs in AppStore. It is very addictive, challenging and fun to play. It is totally free and we plan to add more levels and features in upcoming versions. Football physics is a fun way to pass the time. Like the sport played on a field, the basic concept of football physics is a simple one – all you need to do to win is put the ball into the net. This game has 32 levels to keep players challenged and they can remove highlighted grass blocks which appear in their way. Simply touch the green blocks to make putting the ball in the net an easier process. Participants need to throw the ball into the goal to advance to the next level. If you decide to test your skills, be sure to avoid the enemy red blocks which will appear in your way and be sure to remain upright. A player who falls down loses the game automatically. In case you need more information or anything else please do not hesitate to contact me. We would like to ask you to review our new game for iPad “Paradise Beach” on your site. Paradise Beach is an addictive, tycoon-style, click management game where you have been selected to design, build and manage of some of the world’s leading beach resorts. Paradise Beach is a free app with In-App Purchase, so no promo-codes are available. If you decide to buy full version, I will be glad to send you money back via paypal or else. Nevosoft is proud to release Paradise Beach, an addictive, tycoon-style, click management game for iPad. In Paradise Beach, you’ve been selected to design, build and manage of some of the world’s leading beach resorts. Select and build different things to amuse and please the tourists that visit your resort. New elements are gradually introduced to keep the game both interesting and challenging. At the beginning of the game you’ll take a short introduction course on how to build beach resorts. Your tutors are Emmy and her grandfather, Mr. Gates, the tropical archipelago’s owner. Follow their advice, complete their tasks, and if you succeed, Mr. Gates will make you his business partner. The graphics are detailed and all the guests walking around your resort are pleasant to look at, especially when the screen is dominated by green smileys. This game involves simultaneously managing individual demands, strategic thinking and wise planning.